Wowza, what a week it has been here around our house! Monday was ER day, both for our mini doxie, Charlie who has been diagnosed with IVDD in his upper lumbar (neck region) and my hubby who I had to rush to the ER on Monday also because he had a cut that he’d picked at that was right over a varicose vein which of course became a bloody crime scene out of CSI in our bathroom. 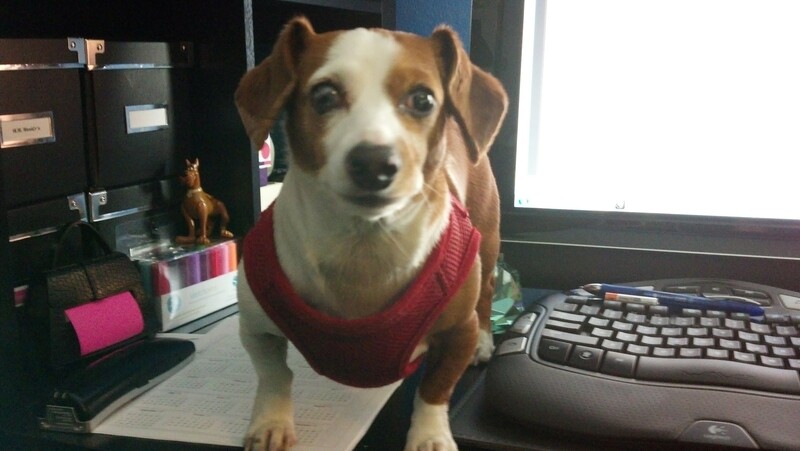 My sweet mini-doxie Charlie the helper. This pic was taken about two years ago during a snow day when I worked from home and he was my helper. Our doxie is on strict crate rest for 4 to 6 weeks which includes being carried to and from potty breaks and meals and is taking steroids and pain meds for the next couple of weeks. It has been very emotional for me to see him in pain and feeling so helpless for him as there’s no cure for IVDD and he could become paralyzed at some point down the road. We don’t have kids so he’s my fur baby that I’ve had since he was 12 weeks old. As for hubby, after a solid 30 minutes of compression on his leg in the ER by the nurse to stop the bleeding, my dear hubby has been lectured by myself, ER staff & doctors and his sister about picking at cuts on his legs. We got home at 3:30 am in the morning on Tuesday after quite the emotional roller-coaster of a night. So between work, hubby and the round the clock treatment for the doxie I have been so exhausted and haven’t had time to do any crafting this week which makes me sad because I’ve had a couple of really good crafty hauls this past week (think snowflake stamps & dies, Christmas sentiment stamps and Holiday Cheer hats & gloves sets from WPlus9 Stamps, Faber Castell Polychromos pencils and Greeting Farm Secret Santa stamp sets). I have been itching to play so bad, but the sleep deprived me hasn’t been able to keep my eyes open in the evenings to do anything. I’m penciling in some crafty “me” time for the weekend for sure. Onto the card today which is my final card for Halloween. It’s funny, I think I actually only made like 10 cards for Halloween, but I feel like I’ve been working on them for months. It really is hard adjusting to the holiday card making schedule for crafters. Hopefully, someday it won’t seem quite a foreign to work so far ahead. I guess retailers do it with no problem, right? Today I’m sharing a card that I made using a digital stamp from one of my favorite stamp companies. This is Hallo Bean from The Greeting Farm. Isn’t she adorable in her little hat and cape with her faithful kitty by her side. I just love her! 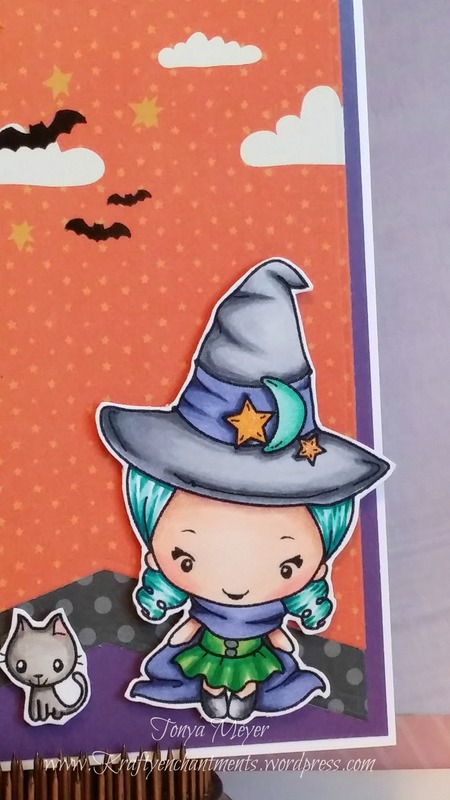 Of course her and the kitty were colored using my Copic markers giving her some wicked blue hair and a purple-grey cape & hat and then fussy cut out. I did add a hint of Wink of Stella clear sparkle to the moon and stars on her hat. My card base is from a Neenah Solar White 80lb cardstock. I added several layers of patterned paper to my card base. I used a pack of 6 x 6 Halloween themed papers from DCWV, Inc called Spooky Delight stack. It has a lot of really cute retro themed Halloween images in it and all sorts of patterned papers. I selected one that looked sort of like a night-time scene with the moon and clouds in the background and then die cut it using the Jumbo Fishtail banner Stax from Die-namics. I cut a second fishtail banner out of some black polka dot paper and layered both on top of a deep purple square. Next, I used several of the regular Fishtail Banner Stax and die cut several pieces of cardstock in varying colors and layered them on top of one another. I added three little black gem embellishments to the tips of one layer of flags for some added dimension. Once my final layer was in place I stamped the Trick or Treat sentiment and the little tiny candy corn from the Winnie stamp set from Jane’s Doodles. 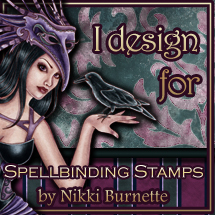 That stamp set was a gift from my amazingly talented and ubber crafty friend, Carisa Zglobicki over at Inky Fairy Designs. She’s such an inspiration for me and I learn something new from her every day! So a huge thank you to her again for the awesome gift. I didn’t get to use many of the other images in that set yet, but you never know I could do a Halloween in July “thing” next year just to get a head start on the season, lol! I put some dimensional foam on my little Hallo Bean and her kitty and layered them onto my Jumbo Fishtail Flags that I’d already cut. 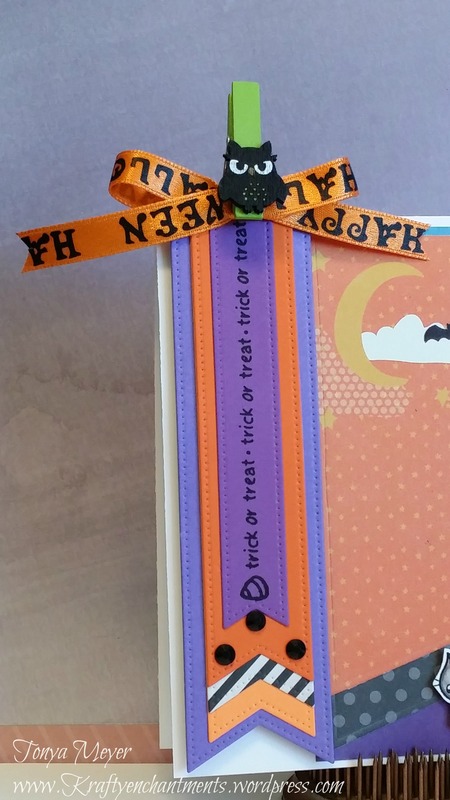 To finish off my card I made a bow out of some Halloween ribbon and added the cute little wooden owl clothes pin on top of it (and yes after it was all assembled and I showed it to my hubby, he pointed out that I tied my ribbon upside down). Just goes to show that I’m human and it’s most definitely hand-made, LOL! When you have such cute images as those from The Greeting Farm you don’t have to work too hard to put a fantastic card together. Completed final Halloween card for 2015 featuring The Greeting Farm digital stamp Hallo Bean and her kitty. That’s it for my Halloween cards this year. Several of my cards are making their way to treasured family and friends along with some treats this week. Hope everyone has a safe & very Happy Halloween! !